I have been using this product for more than six years. It is a lifesaver. I recently had shooting pains for 17 weeks down my lower limbs and was concerned about being able to drive the distance of 1700 miles over six weeks to teach at an important event. I was able to take the trip and I attribute my ability to drive to AminoActiv. You can read about my experience on the @PlantYourDreamBlog here. AminoActiv saved the day. The Natural Anti-Inflammatory made it possible for me to drive my 68 VW Van and quell shooting pains that made me question if I could take this trip. Inside view of the Enchanted Garden Mobile, my 68 VW Van. 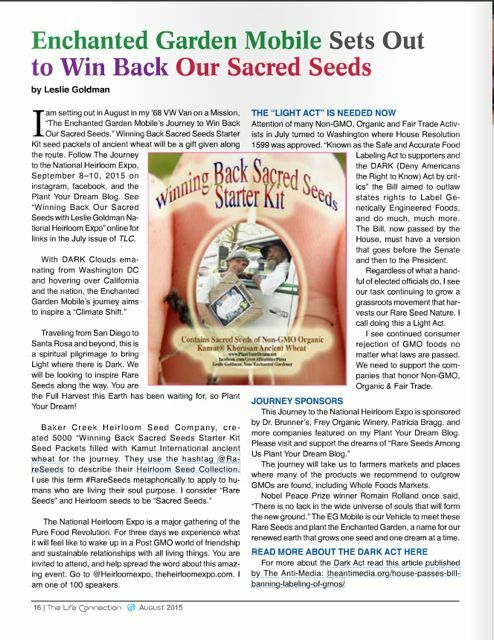 The Life Connection Magazine-August 2015 had this article about the Enchanted Garden Mobile's Journey to Win Back Our Sacred Seeds. I had quite a journey this summer being on the road for six weeks driving more than 1700 miles round-trip on a Campaign to Win Back Our Sacred Seeds. I drove all the way from San Diego to Santa Rosa California to teach at the National Heirloom Expo organized by Baker Creek Heirloom Seed Company. There Whole Seed Catalogue features more than 1800 Rare Seeds from around the world. Seeds that represent Indigenous Cultures waiting on the sidelines of Nature's Original Technology, ready to help a humanity on the brink of loosing its bio-diversity. I went beyond this distance, stopping at various Whole Food Markets and places of interest along the way, as went as far as the Frey Organic Winery in Redwood Valley, the home of one of my sponsors. The Frey land is the place where I annually retreat; and key leaders in the family are proponents of BioDynamic Agriculture. Their Blog is here. 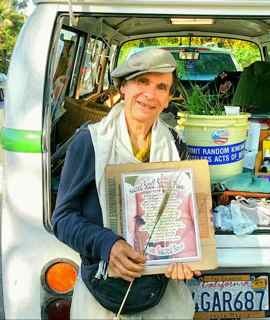 My vehicle is a 68 VW van that I call the Enchanted Garden mobile, I will tell that story on this Facebook page called The Enchanted Garden Mobile's Journey to Win Back Our Sacred Seeds more fully. I will repeat this Campaign Theme in 2016. This mission is my passion; I see the United States becoming a nation of gardeners and farmers out of the necessity to reconnect with our roots in soil. I believe that the Heirloom, original seeds of the world, are calling out to us to plant them. I work with number of sponsors who believe in my work. 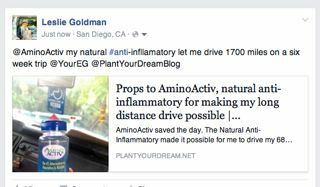 You will find a link to AminoActiv on my Wordpress Plant Your Dream Blog because this is one of the key remedies I have used for more than six years that helps me fulfill my mission. The national Heirloom Expo was very successful. I did the opening and closing ceremony and I touched a lot of lives planting dreams along the way in a pot of soil. On the final day of the The National Heirloom Expo, I reached out and planted dreams with children. 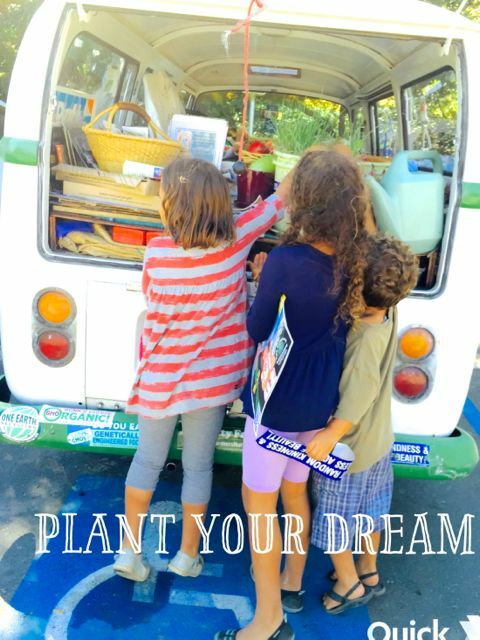 Kids Planting Dreams in Sebastopol, Northern California at the Luther Burbank Farm, hundred of miles from home on my Journey to Win Back Our Sacred Seeds. Could I make the Drive to the National Heirloom Expo, to Help Win Back Our Sacred Seeds? For many months of 2015, I wasn't sure I could do the drive. I had been having pains shooting down my lower lambs for more than 17 weeks before the journey. Even at the time, when I was writing a major article, called Tips to Win Back Our Sacred Seeds for The Life Connection Magazine, I wasn't sure I was physically capable of driving the EG Mobile that distance. My anti-inflammatory of choice is called Amino Activ. I first discovered this natural medicine in a pill about six years ago at the Natural Product Expo West, a large gathering of the natural and organic food industry where multi-millions trade hands. 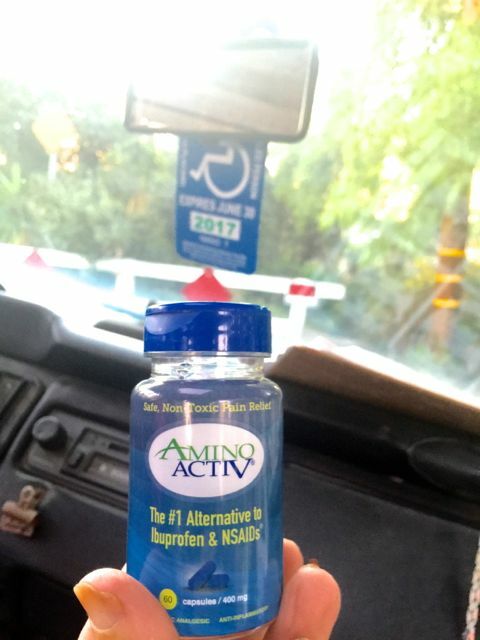 Over the years, AminoActiv has been a life shifter for me, pulling me through some extreme muscle pulls that would have lasted much longer; and headaches. My condition in Western medicine is called Anglyosin spondylitis, a form of arthritis that I've had since my teenage years. I just had my 68th birthday November 19. Aside from regular treatments of acupuncture, and a few other supplements that work for me, I shy away from most conventional medicines. I have had bad experiences with Ibuprofen, that once left my bowel debilitated for more than a year. My first experiences with taking arthritis drugs as a teen we're devastating to my digestive track as well. I believe that AminoActiv belongs in the hands of Integrative Medicine practitioners. I believe it is a important alternative to the pharmaceutical drug called Ibuprofen and the over the counter drug called Advil. Both these pharmaceutical drugs have significant side effects. In recent years I've recovered from a kidney procedure called Lithotripsy that generally involves drugs for post procedure pain relief. I was able to use AminoActiv rather than the prescribed Narcotic drug Hydrococodone. Aside from the Anti-Inflammatory results I get from AminoActiv, this remedy appears to have a remarkable relationship to shifting my energy. When I take it the difference in my energy levels are Night and Day. Some days, I am shocked with how tired I am. When I take AminoActiv I have sustained energy, quite different from the commonly sold over the counter products that are the rage now on college campuses and in many places and give five hour or more bursts of energy. AminoActiv seems to release natural energy inside of me providing some kind of Amino Acids and homeopathy I imagine that I need. It concerns me at times that I feel dependent on this pill from a bottle, and yet I'm grateful that I've found a supplement that releases energy and acts as an anti-inflammatory. I know that the pill does not replace self care. There are times I use AminoActiv when I simply need a boost, yet I do my best to recognize that there are days I simply have to rest more. On the week prior to my six week trip in August and September, I found the combination of AminoActiv dosage that allowed me to make the drive that otherwise would have been impossible. The shooting pains were extensive, and no other remedy seemed to help as much. During that time, I was doing Tai Chi classes twice or more a week. I combined taking it with doing stretching exercises that were part of my regimen, and I have enough energy to build up my strength. I am a person that likes to sit at the computer for many hours working. I have learned that I had to adjust because sitting would bring on the shooting pains. I backed off for numbers of months, and started writing from my Iphone more. Lately, I have been able to sit more, but clearly sitting stimulates the shooting pains. AminoActiv is playing a role in my ability to continue to sit, and quells my lower back stiffness. During intense groin pulls, I have used AmioActiv around the clock, every number of hours. On my six week journey, I took two pills every three hours to quell the shooting pains down my calfs. My normal dosage is about one pill in the morning, and another as needed. I generally do not need to take more than three to five pills a day Of course, That is my experience. I would recommend that you introduce this natural Anti-inflammatory to your doctor, and use it with care. During my Kidney procedure recovery, I was also use it around the clock every few hours. I don't know if AminoActiv Will work the same for everyone. Something in this remarkable formula works for me. I am most grateful to the staff and inventors from Vireo Systems for this outstanding contribution to my life. I was in the hospital for an outpatient Kidney stone Procedure last Wednesday, June 25. Yesterday the stent was removed, Monday, June 30, 2014. I am happy to report that I was able to avoid using the prescribed Narcotic drug Hydrococodone. I used AminoActiv instead. There was some pain from the stent inside me, but I did not want the toxic side effects of the narcotic.